Having a portable kitchen island has many benefits; they can be moved easily around the kitchen to make meal prep more convenient, they can be re-positioned to accommodate guests, and they’re a great way to add a modern industrial touch to your space. 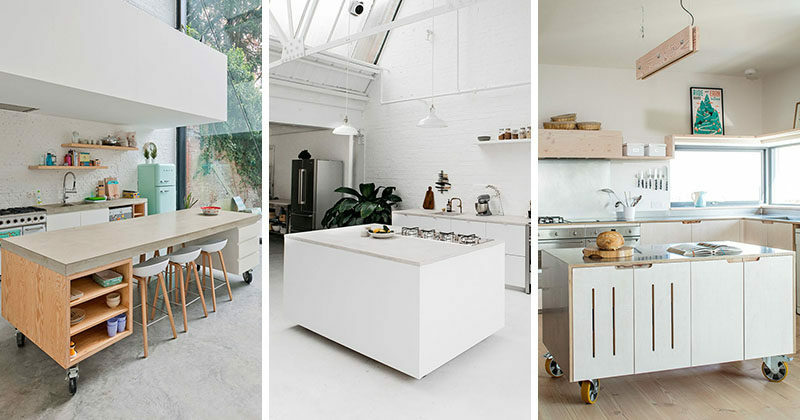 Here are 8 examples of portable kitchen islands in modern homes making life easier and more convenient. 1. Two separate movable tables can be positioned together to make the layout of industrial style kitchen island customizable. Specht Architects and Louise Harpman designed this renovated house overlooking Lake Austin in Texas. 2. A stainless steel surface and large industrial wheels on the bottom of this simple movable kitchen island give it an industrial look while still keeping the overall look of the kitchen minimalist and bright. 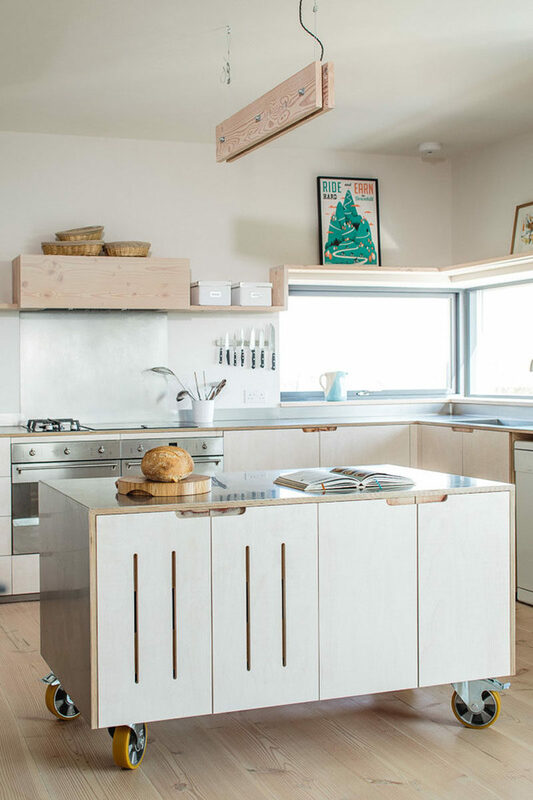 Sustainable Kitchens designed this kitchen in a home in the UK. Photography by Brett Charles. 3. Concrete, wood and white drawers make up this movable kitchen island design, keeping it consistent with the modern eclectic look of the rest of the kitchen. Sculp[IT] designed this home in Antwerp, Belgium. Photography by Luc Roymans. 4. 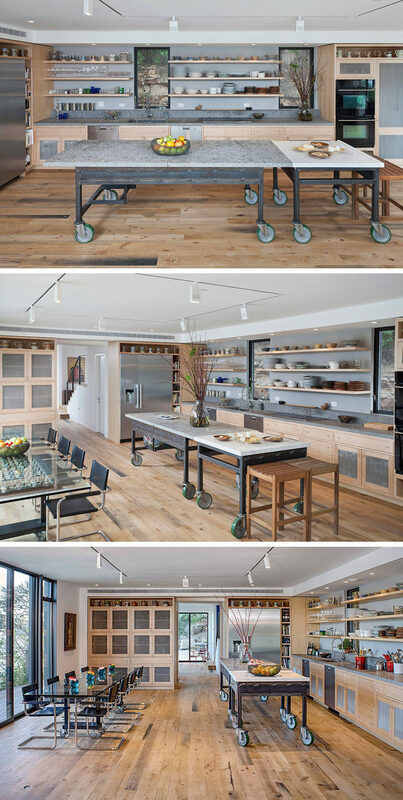 The wheels on the bottom of this movable white kitchen island with a wood countertop, lets people move it around so they can prep things closer to the rest of the counter or move it out of the way entirely when they need more floor space. B Sherman Workshop designed this kitchen in a New York office. 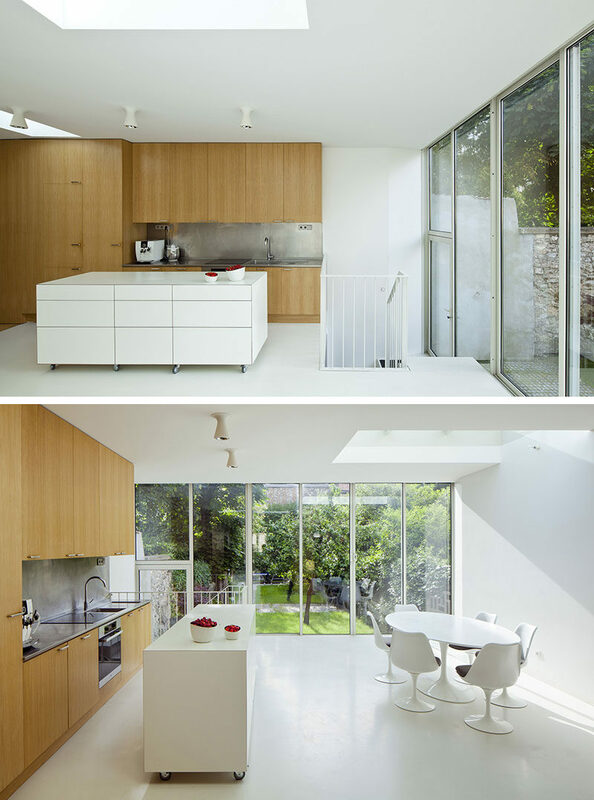 Interior photos by James Ransom. 5. This movable kitchen island in this bright and modern kitchen, can either be left in the middle of the kitchen or pushed off to the side to make room a large gathering or a family dinner. 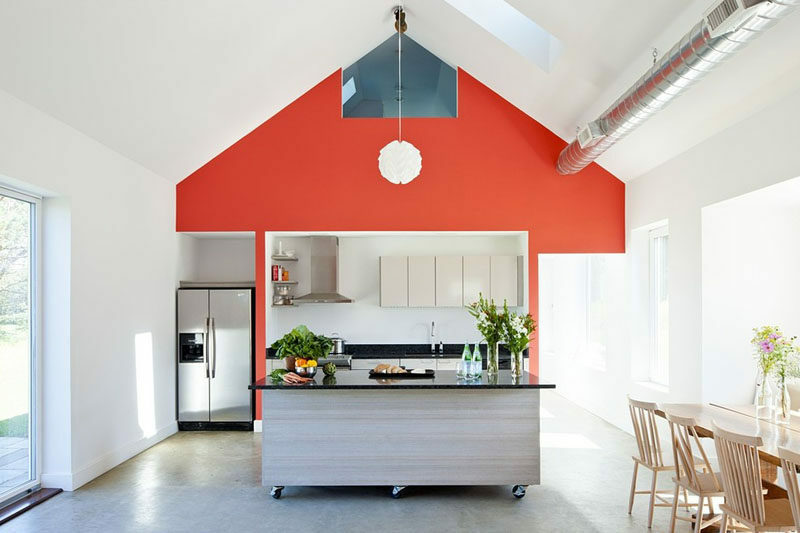 ZeroEnergy Design designed this passive home in Providence. Photography by Greg Premru Photography. 6. Both the modern kitchen island and the dining table can be moved in this modern interior as they both have wheels on the bottoms of them, making it easy to clear the floor and configure the layout exactly how it needs to be. Maxwan Architects designed this barn conversion in Geldermalsen, The Netherlands. Photography by Filip Dujardin. 7. 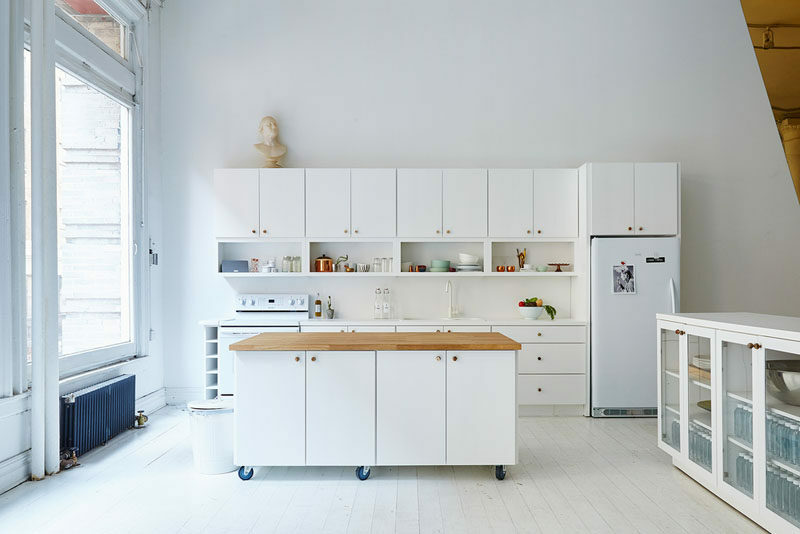 This large, white, movable kitchen island can be used as extra prep space right in the kitchen or be pushed up against the wall to create a sideboard perfect for serving multiple people. AZC designed this house in Vincennes, France. Photography by Sergio Grazia. 8. The sides of this movable modern kitchen island come down quite far to partially conceal the wheels on the bottom and creates more continuity in the bright white kitchen. Inspiration from a kitchen photography studio designed by Holly Wulff Petersen and Renée Kemps.